The acronym GIS stands for Geographic Information System. That system is made up of four essential elements: Hardware, software, data, and an operator. Most of this post is going to concentrate on the data element. However, I’m going to start off by talking a little bit about software and the operator. I’ll leave the hardware part up to you. Yes, it is possible to do a buildout without using a GIS. I’ve seen it done. I do not recommend it. Most non-GIS buildouts use something like Excel for the software and the local assessors database as the data source. They were popular a few years ago before GIS became as ubiquitous as it is today. Now, with so many people learning and using GIS, and so much GIS data available, spreadsheet buildouts are becoming very rare. I use ESRI software for all of my work. I have been playing around with some open source OS’s and GIS software recently (e.g. QGIS, GRASS, SAGA), but ESRI is what I cut my teeth on, and I still use it every day. I’ll try to make a conscious effort to make these posts as non-proprietary as possible, but ESRI is what I know best, so some of the more specific examples will undoubtedly show that. I’ve looked into specialty software occasionally, or software add-on/extensions that are supposed to make the buildout process easier. I don’t use them. What I’ve found is, the most tedious part of a buildout is getting the data into a condition that’s usable. That has to be done whether or not specialized buildout software is used, so why spend the time learning how to use it? (I welcome any feedback on this from anyone with a different point of view). Diving into the data and performing most of the buildout operations “by hand” forces the operator (next section) to become intimately familiar with the buildout study area. Performing these many tedious tasks reveals information about the municipality that never comes out during a workshop, survey, or focus group session. The person performing the buildout should understand how planning works. A buildout is not just a mathematical equation applied to a bunch of digital map layers, it’s a planning exercise. Planning decisions are made by people and are often influenced by politics. Two towns might have nearly identical zoning laws, but the way they are implemented can be quite different. One recent example I ran into is a town that “rounds up” when a landowner requests a subdivision of a parcel that doesn’t quite meet the minimum lot standards. What they mean by rounding up is this: The town’s zoning code has a rural district with 3 acre minimum lot sizes. If a landowner has a parcel that is more than 3 acres but less than 6, they will allow the parcel to be subdivided into 2 new lots anyway, even though the zoning code does not specifically allow for this. (Yes I know what you’re thinking, but that’s a whole other series of posts :-) If the GIS operator were to go strictly by what’s written in the zoning code, that little tidbit of information would never be revealed. Less extreme examples of implementation variation involve allowing various amounts of wetlands, water, or other environmentally constrained areas to be included in the calculation of new lots upon subdivision. Some towns are very strict about this while others have a more relaxed attitude. Ultimately, the goal is to get the buildout to act more like the people involved in the decision making process, and less like the inhuman machine that it is. Let’s start assembling some data. A buildout analysis requires data from nearly every level of government there is, from the local not-for-profit land trust, to the federal government. All of the buildouts I’ve done have been for local municipalities in New York State. My main source of data is the NYS GIS Clearinghouse website. However, a few layers are only available through local, county, or federal sources. If you’re working in another state, I suggest starting your data search at that state’s GIS data site. There are others that you’ll want in order to produce a useful map at the end of the process, such as roads, railroads, neighboring towns, etc., but these are the layers I find absolutely necessary to perform the buildout operations. Let’s take a look at each one. I always start out with a definition of the buildout area. Usually this is a town, village, or city, but it can be a smaller neighborhood, or a larger region composed of multiple municipalities. 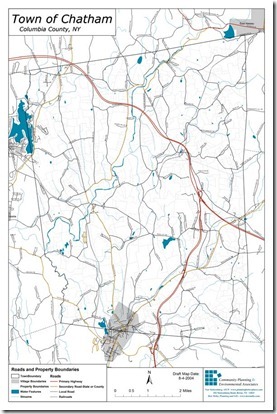 The NYS GIS Clearinghouse has a layer that contains every municipal boundary in the state. I assume other states have similar layers. If you’re working with a smaller neighborhood area, a watershed, or a region, you might have to generate the buildout boundary yourself. The primary purpose of the municipal boundary layer is as an aid to assembling the other layers needed for the buildout. Most of the data will need to be clipped out of larger area layers, or combined from layers covering smaller areas. When I’m putting together a set of resource maps for a town I like to include the data from the surrounding area to provide some context. However, for buildouts I usually clip everything to the boundary of the study area. It makes managing the data a little easier, the processing and calculations happen faster, and it helps to focus the attention of the viewer on what’s in the buildout study area. The tax parcel layer is where all of the action will take place once the other layers are assembled and cleaned up. Tax parcel data however, also has some unique characteristics. In NYS, the parcel boundary layer is maintained by county governments while the attributes are maintained by the local municipalities i.e. town, village, and city (Again, I welcome any info here about how other areas of the country operate). The problem here is that these two sources of data almost never match up completely. In addition, some counties do not maintain GIS versions of parcel data. If that’s the case, scanned tax maps have to be digitized, or if you’re lucky, CAD versions exist that can be converted into GIS layers. Some counties are better than others at supplying proper tax parcel layers, but more often than not, I’ve found it takes a lot of work to get this layer into shape. When acquiring the parcel layer, make sure the attribute table contains at minimum, a unique parcel ID code, Owners name, and property class code. If there is a field that shows the “year built” for each parcel, that can come in handy later on, too. There are multiple sources of data showing open water and streams. 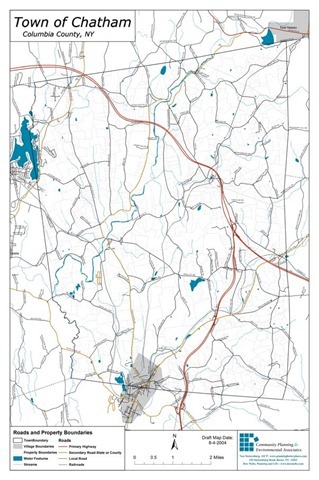 USGS supplies the National Hydrography Dataset (NHD), NYS OSCIC provides 1:24,000 scale hydrography, and many counties include these features as part of their tax parcel data. None that I’ve seen are totally complete, and they usually have to be edited a bit for accuracy. The best federal source of wetlands data is the US Fish and Wildlife Service’s National Wetlands Inventory (NWI). In NYS, the Department of Environmental Conservation (DEC) and the Adirondack Park Agency (APA) provide layers delineating the wetlands under their control. I usually do not do any editing to the wetlands layers. Identifying wetlands requires special knowledge of aerial photo interpretation and field work. If you think the wetlands layers do not represent the true extent of the wetlands within the buildout area, I suggest using a hydric soils layer extracted from the soils data mentioned below. Flood hazard layers are notorious for being one of the most inaccurate layers available. There are some areas of the country that have been updated using LIDAR and other state of the art techniques, but if your study area is not in one of these high priority locations, you might be out of luck. 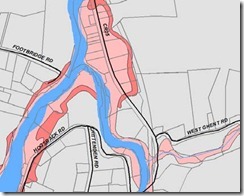 FEMA produces a variety of layers showing flood hazards. I suggest starting your search at the FEMA Map Service Center website. You should also check with the local and county governments for the buildout area. If flooding is a problem in the buildout study area, chances are there is some flood map updating going on. I don’t use soils data in every buildout, but there are times when it comes in handy. If the wetlands and flood hazard layers look a little sparse, or are not available at all, they can be supplemented by extracting hydric soils and flood prone soils layers from the data. One of the problems with soils data is that it is the most complex data source there is. The full soils database includes 64 individual tables. These tables have to be joined to each other and to the spatial layer properly in order to make use of the information contained in them. Luckily, there are only three tables that need to be used in most GIS resource mapping exercises. I’ll discuss how to extract the pertinent data in a future post. If you’re ready to dive into soils data, take a look at the NRCS Soils page. Using a digital elevation model (DEM), various slope categories can be produced to identify land that is unbuildable or constrained to development due to steep slopes. DEMs are also used to produce watersheds at a larger scale than what’s available through the Watershed Boundary Dataset (WBD). These catchments can then be used to evaluate the impact of the buildout on specific areas. If there are specific slope regulations in a town’s zoning or subdivision regulations, use those to produce the steep slope layer. Otherwise, I usually generate a layer that shows slopes over 15%. 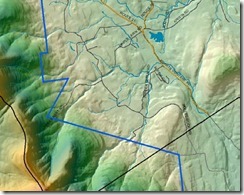 Seamless elevation data can be downloaded through the USGS National Map Seamless Server. If this doesn’t work for you (and it hasn’t for me on occasion) individual DEM tiles can be downloaded and mosaiced together. Zoning districts are defined by the local government. In addition to the zoning map, the zoning text and any adopted changes to that text should be reviewed thoroughly. Many times I’ve found discrepancies between the adopted map and the text that the town did not even realize existed before starting the buildout. This is one layer that I often have to produce myself. 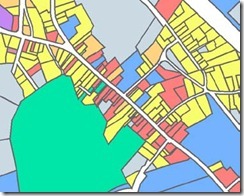 The zoning district layer should include the minimum lot size or other density requirements for each district. If a buildout is being done for a town without any zoning, interviews with the local planning board members can reveal how decisions are made regarding subdivision of land. This layer helps identify properties that will never be built upon because of government ownership. Most of this data can be derived by looking closely at the parcel layer’s attributed, searching through the property class code and ownership field. However, it helps to have these additional layers to verify the parcel layer and to fill in any blanks. 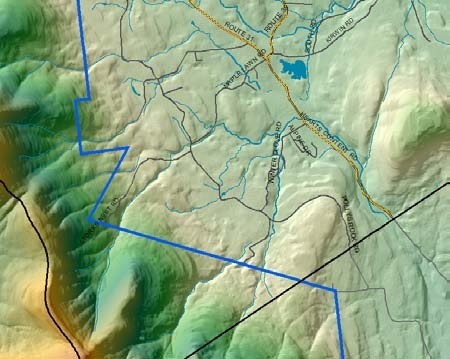 Most parcel data does not come with information regarding conservation easements on the property. A call to the local land trust will usually turn a layer or two with that information. If it’s not in GIS form, a list of properties is usually available. Although private property easement data is considered public information, some land trusts are reluctant to broadcast that information widely. They might ask that the data be kept confidential. Orthophotos are aerial photos that have been georeferenced and geometrically corrected. They are not used directly in the buildout process, but are handy for editing other layers and identifying missing features. Most states and a number of federal agencies can supply orthophotos. 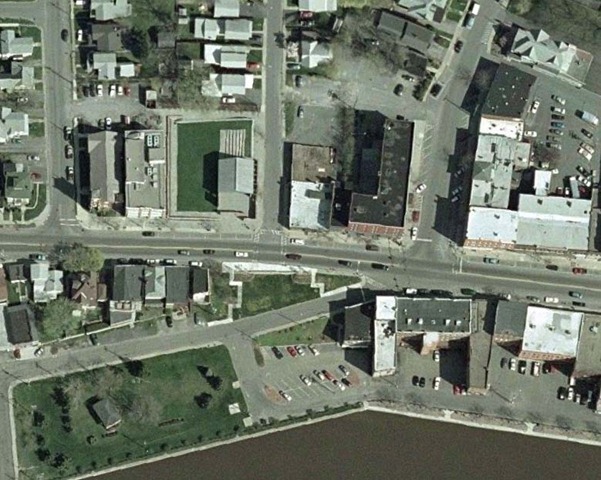 Using the latest incarnations of ArcGIS, imagery can be added through a Web Map Service, too. The next post in this series will be about cleaning up the data once you have it, getting it into a form that’s useable for the buildout calculations. This entry was posted in GIS, Planning and tagged Buildout Analysis on June 24, 2010 by Don. The most common type of analysis I’m asked to do for my clients is a buildout. Buildouts are usually done in the context of a municipality’s comprehensive plan or zoning update. After assembling and examining a complete set of resource maps, my clients often request an analysis of how these resources interact, and where potential conflicts might occur. One way to accomplish this is through a buildout analysis. In my 8 years working as a planner I’ve performed buildout analyses for over 25 towns and villages, often with multiple iterations per town. There are many websites outlining the process in general terms, but few get into the nitty-gritty tedious details neccessary to perform an accurate buildout. Most of those details I’ve learned through trial and error. One purpose of this series of posts is to share some of those details with others so they might avoid the pitfalls I ran into. If I’ve learned anything through my work with GIS it is that there is never just one way to do something. That being said, another purpose of this series is to encourage others to share thier experiences, and make suggestions about alternative methods of performing the many GIS operations required for a buildout. Explaining the many steps involved in a buildout analysis in as much detail as I want to will require more than one post. So, I’ll start with an initial overview of the process and an outline of my plans for future posts which will include more of the nitty-gritty details. A buildout analysis is an exercise designed to estimate the amount of development that can occur if all developable land within a defined area is developed according to a municipality’s land use regulations. The buildout analysis applies current land use regulations and typically considers environmental constraints that can limit development in certain areas. It then calculates the total residential density allowed at full buildout of the area. The defined area can be a single parcel being contemplated for subdivision, a neighborhood, an entire town or village, or a larger region encompasing more than one municipality. For this series of articles I will focus on buildouts performed for a single municipality, typically a rural town or village. It is important to point out that these buildouts do not predict when full buildout will occur, at what rate it will occur, or where it will occur first. It only predicts the possible end result. There are some models that attempt to predict these characteristics, but my experience is that these models are wildly innacurate, especially when used for the small towns and rural areas I work with. 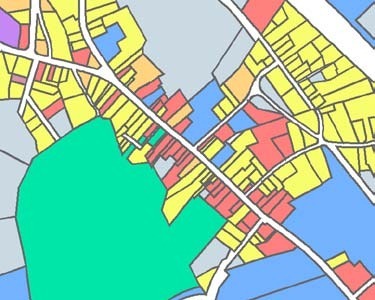 Calculate the amount of new residential development allowed by the current land use regulations in the remaining develpable areas of the Town. In essence, the analysis calculates the total land base of the town, subtracts all lands having environmental constraints and completely built areas, and then applies the various development rules to calculate the number of allowable new residences. For purposes of the analyses included in these posts, the buildouts will assume that all new development will be single-family homes. It is important to note that the results of all of these calculations are only estimates. The GIS layers used are not exact replicas of what is actually found in the real world, only representations of what is there. The processing of the data also introduces a certain amount of error, and can add to the inaccuracy of the data. The only way to get an accurate count of allowed residential uses on a particular property is to do an on-site survey of existing conditions. The following list outlines the specific steps involved in performing a buildout. I plan to describe these steps in much greater detail in future posts. This entry was posted in GIS, Planning and tagged Buildout Analysis on June 22, 2010 by Don.